Kopelman Quartet, Elizaveta Kopelman, Piano; Works by Tchaikovsky, Penderecki, and Franck, Vancouver Playhouse, October 9, 2012. Central to the repertoire of any string quartet are works in which it can play alongside a piano. Yet most concerts feature only a handful of such works. The Piano Quintets of Schubert, Schumann, Brahms, and Dvorak form the core, with occasional ventures to those of Gabriel Faure and Shostakovich. The Piano Quintet of the 19th C. Belgian composer, Cesar Franck, is a remarkable work yet, in years of concert-going, I have never heard a live performance of it. While there have been recordings over the years, perhaps this neglect is explainable. Franck’s Piano Quintet did not have a good start. Written in 1880, its dedicatee, famed composer Camille Saint-Seans, disowned the work on its premiere performance, leaving behind the original manuscript. Indeed, one can point to a lack of sophistication both string and the piano parts; the themes are often pretty simple and some of the piano writing could almost be described as crude. Yet why would Tournemire refer to this work as the ‘king of piano quintets’ and why would Parisian audiences demand that it be played again and again? Largely because it conjures up an uncomfortable world of passion and melancholy that goes much beyond the emotional range of many of the prettier pieces written at that time. In Franck’s Piano Quintet we find ourselves more in the brooding, unsettled post-Romantic world of Schoenberg in his Verklerte Nacht or possibly Scriabin. It is the darkness of expression that attracts some and pushes others away; the work’s chromatic melodies are not really that different in form than those in the composer’s ever-popular Symphony in D or the Violin Sonata in A. Traditional performances of the Quintet have sometimes tried to remove its apparent excesses by playing up its refined beauty at the expense of its raw passion. Not on this occasion! The Kopelman Quartet, with pianist Elizaveta Kopelman (the leader’s daughter), played it all out with phenomenal grip and weight. While the old-world Russian style of this ensemble may be too heavy and rugged for some pieces, here it fit perfectly -- bringing an intensity, concentration and glow to the whole work. The ebb and flow of the writing was judged perfectly, from the quiet rhapsodic piano statements at the opening to the volcanic punctuations from the full group that come later on. There was power, and indeed volume levels seldom heard at the Playhouse, yet there was always soft tenderness alongside. So exactly balanced was the group’s sound that one could hear every instrument at all times, including the softest piano notes. Each movement seemed to build naturally to its climax, evoking the deepest feelings. The care with which the quartet exposited the final movement was something to marvel at: each player so aware of what the others were doing, the pianist always watching her father, and the incredible beauty of the latter’s playing at the end. It all flowed as a beautifully-enchanting story. For all the top-drawer performances that the Friends of Chamber Music has brought to us, I found this one pretty overwhelming and unique. This is a much greater work than I had thought. While one might think of the Quintet as tragic, indeed the most glaring tragedy was that the performance received a muted reception. Not even a single encore was invited. 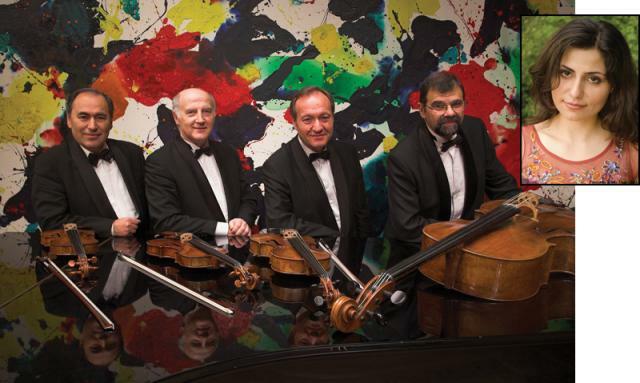 Compare this with last year’s Brahms Piano Quintet with the Emerson Quartet and ‘the father of modern chamber music’, pianist Menahem Pressler. Here the Emerson’s played so loud and aggressively throughout that this poor pianist, now almost 90 years, could hardly get a note through. The pianist had to force things, making mistakes, at one point coming in bars too early. Yet this performance, involving the closest thing to ‘elder abuse’ I have seen on the concert stage, received an immediate standing ovation and an encore. For an introduction to the Franck Piano Quintet, one could hardly do better than sampling the excellent Naxos recording (8.553645) with the Ludwig Quartet and pianist Michael Levinas.